When it comes to internet privacy, most computer users out there do not actually know much. It is really important that we stay protected since online browsing is not as safe as possible. There are so many individuals out there that simply share all personal information online and expect it to be completely safe. Even when you share on Facebook you need to be sure that you use the proper privacy settings in order to have the experience that you want. 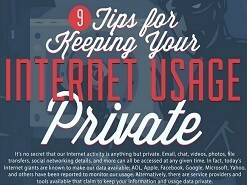 The 9 Tips For Keeping Your Internet Usage Private infographic below allows you to realize exactly what internet privacy is all about. It features really interesting statistics that are real in 2014 and that every single online browser should know this. Besides the statistics offered, you are also given various tips that can help you to make a safe choice at the end of the day. Make sure that you analyze what is written about the alternative browsers that you have to consider like Chrome or Mozilla Firefox. There are way too many individuals out there that still use Internet Explorer. Have patience and go through the options available, including a browser bundle that you most likely knew nothing about so far. When referring to email stats, you have to learn everything about available options. Losing your email address is something that can bring in so many problems. Make sure that you protect all your free email accounts and, if possible, try to use paid services because of the fact that they offer much more security. We will not bore you with more information and we would like to invite you to take a look at the infographic. It is one of the best offered on this subject so make sure you take in all the information offered.